A feast for all of the senses! 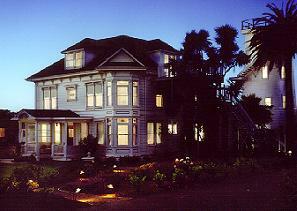 A romantic retreat to a time and place of elegance, grace, and charm. 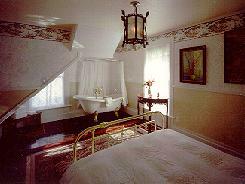 Eight luxurious guest rooms restored and decorated for you to experience the pinnacle of Victorian refinement. Stroll through five English gardens, relax on the gracious front porch, clink your glasses and kiss in front of a roaring fire. Here you can find the rest and privacy that you need. For breakfast you will enter our stunning ballroom to feast on a lavish gourmet breakfast served while you sit and chat. walk off that breakfast by ascending our water tower for a dazzling view of the Pacific. Evenings are filled with four star restaurants, live music, and time for each other. Our guests say it best: "Everything was just perfect!!! Your special attention to helping us make plans, your friendly attitudes, great food, everything, was exceptional!!!"